BUT is the $1,495.00 (+/-Â£1,550.00) reasonable? Is teh 'kit' available elsewhre at a less expensive price? The fact is Doug, running on 13" rims, as you are, means that you can fit the later 8.4" discs that are a hell of a lot cheaper than those 7.5" Cooper type ones. A quick search under disc brakes mini on ebayUK turned up 3 sets on the first page ranging from a start price of 99p to a buy it now price of Â£65. Used, admittedly, but even with some titivation bits and shipping still less than that price. Mini spares have the kits as well. Wally2 wrote: Mini spares have the kits as well. Is it easy for a complete idiot novice (I am describing my mechanic not me) to install ? All you need is a new pair of drive shafts . . . 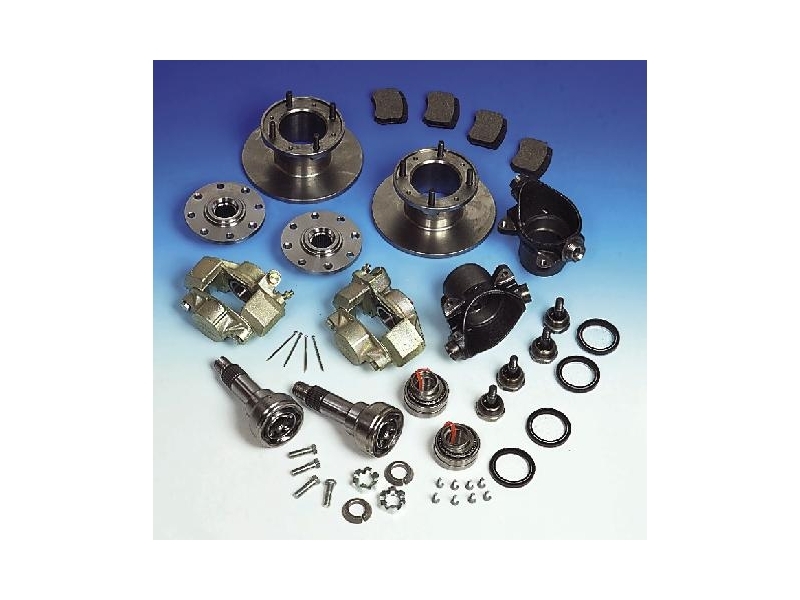 This kit includes every nut bolt and component necessary including uprights, bearings, ball joints, CV joints, brake discs(rotors), drive flanges, calipers, etc. All NEW parts, easy bolt-on installation. This assumes you want to convert from 8.4" to 7.5" discs. I would not recommend this kit for you. As Nigel already said: If you have 13" wheels why not converting to the later 8.4" brakes? It is much more cheaper and has a better function as the smaller Coooper S brake which is designed for 10" wheels. Try to get a complete set of drive shafts and brakes from a later Mini and spend some work for replacing the critical parts (bearings, caliper sealings, brake hoses). Then you will have much more fun. Mini's are scarcer than hen's teeth out here. When in UK I do not have time to scout around and collect bits and pieces. I'd need to get somebody to compile the bits in UK and ship them here. How old is your Moke Doug? If you have "Pot" joint inner CV's (and I think you do) then you have the correct drive shafts for this (8.4") conversion already and the kit should include everything else you need. These will still work though and some prefer them to the standard disc setup. ....but I would replace the shafts with upgraded ones as well.They're not expensive for peace of mind (yours may be worn out). Are you sure? I was thinking the drive shafts of Minis with drum brakes had a smaller diameter than the one with 7.5" or 8.4" disc brakes. Ok, looking at the Minispares parts list there is really only one type of drive shafts. ItÂ´s more than 10 years driving the last Mini with drum brakes so it seems IÂ´m getting old.